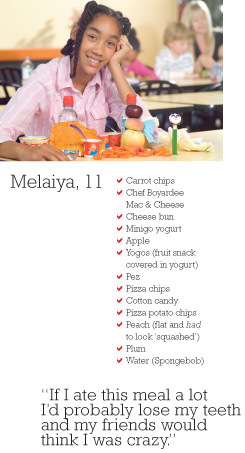 ParentsCanada sent four kids loose in a grocery store (and to all shoppers that day, we're really sorry) to pick what they would like to take for the best lunch ever. Suprisingly, they all had some fruit in their lunches (even some veggies! ), but most opted for the sugar rush lunch. Needless to say, these are lunches we highly doubt would ever be swapped. 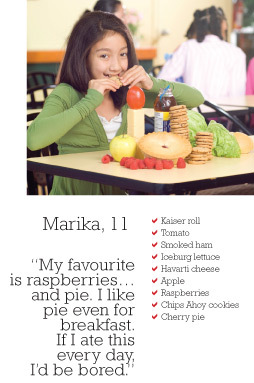 Dietitian, Daina Kalnins from the Hospital for Sick Children weighs in on the kids’ choices. The Yop provides protein and energy, and the wheat snacks provide energy and maybe some fibre (but watch the sodium). Fresh fruit is a great choice for vitamins, minerals and fibre. I would discourage the chocolate pizza slice, cotton candy, Dunkroos, Cadbury thins, Juicy Squirts, Pez and pizza chips! They only provide added sugar and salt. The chocolate chip muffin could be a good choice if homemade. Luke can make a healthy sandwich with his choices. The roll (whole grain would be better), tomato, ham and processed cheese slice (sodium warning there). The carrots and apple offer vitamins, minerals and fibre. The bubble gum drink, pudding, Oreo cake and sour candies would be of no added nutritional value. Due to their limited nutrient value and high sodium content, Luke should skip the Lunchable and Doritos. cookies or the pie (but not both), are a nice added treat occasionally. peach and yogurt are good choices. The Yogos are fine as an occasional treat. Nix the pizza chips, Pez and cotton candy.